You have to admit when it comes to rituals, habits and superstitions, baseball players are the wackiest group of guys on the planet. From avoiding the chalk line to using a lucky bat, for ball players it all comes down to the philosophy of not messing with success (or deliberately messing with failure). If something good happens like a 3-for-4 night with a homer and 6 RBI's, don't be logical and try and analyze why things went so well. Instead, follow common baseball thinking and give credit to the fact that you tapped your left foot exactly three times with the end of the bat just before stepping into the box. And then carry that thought through noting that "if it worked once, it'll work again," and keep up the ritual. 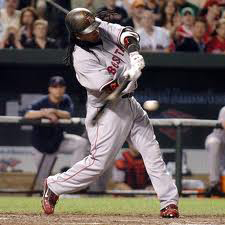 In a prime example of "Manny Being Manny" the newest 500 Home Run Club member Mann es the transferential Mojo in an attempt to mooch off of someone else's good luck. "Man Ram" has been known to poach the gear of a teammate who's on a hot streak. "He'll wear somebody's socks or shirt if a player's been hot," veteran pitcher Miguel Batista recently said "You'll go to your locker and go 'Where's my damned undershirt?' And guys are like: 'Oh, Manny may have it.' If somebody's hot on the team and he's not, he'll wear their socks, their shirt, anything." According to Rangers coach Don Kalkstein, who worked closely with Alex Rodriguez during his years in Texas, Alex Rodriguez touches second base on his way to shortstop during the first inning of every game. Much to the chagrin of Yankees fans, who contend that it explains his unaccountably poor showing in post-season games, A-Rod actively defied the contention that player shouldn't willingly change their numbers when changing teams and the "baker's dozen" is an unlucky number by sporting Yankee pinstripes emblazoned with the number 13. Ken Griffey Jr.likes to drive the same car to the park every day. If two days in a row, he doesn’t get any hits, he won’t drive that car the third day. If he doesn’t get any hits for a week, he ships the car back to his home in Florida and has a new car brought up. Griffey refuses to use a game bat if someone else uses it. 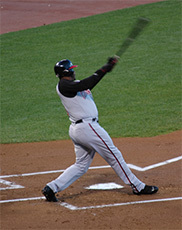 Junior always walks to home plate the same way. He likes to lead with his right foot going into the batter’s box. When dugout on the third base side, waits for the umpire and catcher to settle before heading to the box. Griffey doesn’t eat leftovers (except for after the Thanksgiving meal). In pursuit of the grace of the baseball gods, he has taken showers fully clothed and has also thrown away an entire uniform. When "The Kid" was with the Mariners, teammate Jay Buhner had a 4-hit night. In a demonstration of how far he’s willing to go, Griffey sneaked into Buhner’s house that evening and placed his bat between Buhner and his wife. Apparently, some of the hitting rubbed off on the bat because Griffey got a couple hits the next day. Jim Thome never takes warm up swings until he get into on-deck circle. 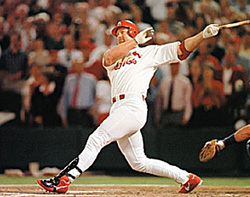 To trigger his powerful swing, he borrowed a pre-pitch routine from “The Natural” in which Robert Redford's (aka Roy Hobbs) digs into the batter's box before each swing and points his bat at the pitcher as if to say "I'm ready...now I dare you to try to throw one past me." Although the pragmatic Frank Thomas claims never to leave anything to luck, he does feel that the effects of karma can come back to haunt players who "diss" others...especially their teammates. Two months after back-stabbing teammate David Wells questioned The Big Hurt's pain threshold with his infamous "no guts ... no glory" soliloquy on his radio show...Wells was forced to undergo season-ending back surgery, effectively ending his Sox career. Thomas had a ready reply Thursday when asked about Wells' back injury. "Sometimes it's karma," he said. "I don't wish anything like that on anyone. Strange things happen in the game. The baseball gods are sometimes looking over us all." 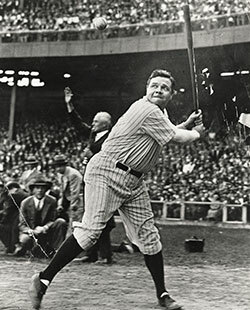 Babe Ruth “The Bambino” (superstitious thorn for many a Boston Red Sox fan) claimed to ignore baseball superstitions. He once said "I only have one superstition... Whenever I hit a home run, I make certain I touch all four bases." Those closest to Ruth, however, reported that he wore a cabbage leaf under his cap while playing baseball, and he used to change it every two innings. He also made a habit of stepping on second base en route to the outfield. Jackie Robinson always passed in front of the catcher when he was coming to bat. If the catcher was talking with the pitcher, Robinson would wait until the catcher was back in position. Harmon Killebrew was so humbled (and superstitious) about the fact that his Silhouette was used to fashion the Major League Baseball logo that he preferred not to talk about it and didn’t answer questions about it. Mickey Mantle proved that he wasn’t going to break a classic baseball superstition that requires teammates must not talk to a pitcher who is working on a no-hitter. It's an obligation that usually results in the pitcher sitting in isolation on the bench in the latter innings. The Yankees' Don Larsen, en route to the only World Series perfect game in baseball history in 1956, tested this superstition in the seventh inning, when he sidled over to teammate Mickey Mantle and said, "Hey, Mick — look at that. Two more innings. Wouldn't it be something?" Mantle got up and walked away without responding. He later chided Larson, who went on to complete the only perfect game in World Series history, for nearly jinxing himself by trying to strike up a conversation, when he should have been concentrating on striking out the opposing team. Willie Mays would always kick second base on his way to center field. Chicago Cubs slugger Sammy Sosa, started each and every game by sprinting out to greet Wrigley Field’s right field fans, and saluted God, his family and his fans after each home run by blowing kisses. Other lesser known, Sosa superstitions included wearing the same T-shirt under his uniform every day during a hitting streak until he failed to get a hit or has a bad day in the field. When asked about this T-shirt superstition Sosa laughed and said "If I don't have it on, it's in the back of my mind. It bothers me. I don't know why I started and I don't know why I still do it, but I'm not going to stop." Home run slugger Mark M te in his career (now that's just plain gross!). When asked about his pre-game ritual, Rafael Palmeiro said, "I always put my helmet on before my batting gloves." But his "real" superstition involves what he's wearing under his jersey. Palmeiro insisted on wearing the same T-shirt game after game whenever he was hitting well. The so-called "Sports Illustrated Jinx" starts with Milwaukee Braves slugger Eddie Mathews, who was on the very first SI cover while the Braves were in first place. Mathews promptly hurt his hand, missed seven games, and the Braves fell out of first place.